#UNLEASH19, the biggest annual HR Tech event, has drawn to a close and it was a fascinating couple of days. The HR Tech space is innovating and growing unlike any other with Josh Bersin stating $16 billion has invested into the space since 2009. 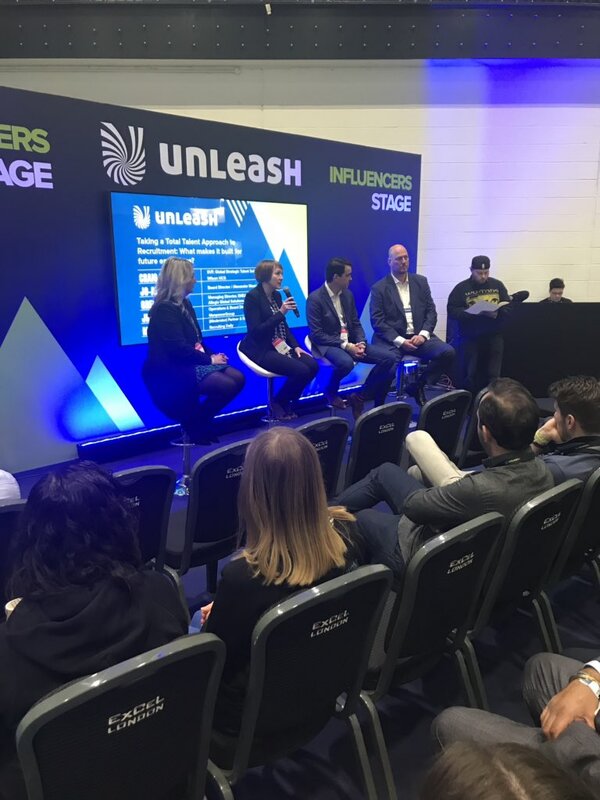 UNLEASH really demonstrated investment in the space across all areas of HR from payroll to employee wellbeing, as well as larger tech players building HR Technology e.g. IBM and Facebook. As we were next to the Startup stage it was interesting to see the extent of emerging players and innovation in the space and a massive congratulations to EVA.ai for winning the prestigious Startup competition. It was interesting to see influencers in the space looking at future HR technology trends and topics currently prevalent amongst HR Professionals. Stephen Reilly of Mott Macdonald spoke about the importance of enhancing the candidate experience of applying for jobs. Companies should treat candidates like customers and look to efficient customer facing companies for inspiration such as Amazon and Uber. Tech should be integrated at the right points of the hiring process for the right reasons, not just integrating for the sake of it running the risk of simply elongating and complicating the hiring process further. An efficient hiring process is not only effective at attracting the best talent but will enhance your employer brand and improve candidate referrals. Matt Charney moderated a panel examining how to employ a future ready workforce and using a ‘Total Talent’ approach to recruiting. A total talent approach is designed to complement a company’s broader talent programs. This can be largely done through outsourcing talent when necessary by using teams of temporary and permanent workers and therefore having access to wider talent pools and skillsets. Where there are skills shortages companies can also deploy technology to overcome this too. It is important to think of business goals and objectives first and foremost. As Greg Barber, Managing Director of Allegis Global Solutions stated, ‘it’s about asking yourself what work needs to be done and then how to I get the talent needed to do it…it’s about turning the question around’. Not only does this ensure maximum ROI but it also promotes companies to be agile in a time when agility is critical to a company’s success. Employee well-being was a focus throughout UNLEASH. Building upon the fact that millennials now make up a much larger proportion of the workforce, this comes with different demands and different outlook on the relationship between and the employer and employee. With employees feeling overwhelmed with the ‘always on’ approach to work and a broader societal shift towards a growth in awareness of wellness both mentally and physically, addressing employee well-being has been a growing priority in HR and therefore reflected in HR Tech and the proliferation of wellness apps. Cal Henderson, CTO of Slack, also pointed out that whilst people are staying in their jobs for less time they want a better relationship between work and work tools enabling them to have a better quality of working life. This is particularly prevalent with company loyalty disintegrating and companies promoting employee well-being will work to attract and retain employees whilst upping the employer branding. The HR Tech world is growing at an enormous rate making it ‘one of the most exciting times ever to be in the HR Technology world’ as stated by Josh Bersin. This is due to an amalgamation of factors. The working environment is changing with employees living longer, skillset demands continuously evolving and more millennials entering the workforce, the demographics of the workforce are changing dramatically. This is in parallel with the growth of a flexible working environment and employers and employees having a more untethered relationship. With the environment HR is operating in undergoing such disruption, increased pressures placed on the HR function and with the advancements in tech allowing it to play various roles the Tech options at HR’s disposal are huge. From wellbeing apps and learning platforms, to onboarding and talent management software the options are endless. The next question for HR is which solutions to use, and when? It’s increasingly important to audit the solutions you use and ensure the right mix is adding value to your HR process. And, most importantly, we wanted to say a massive thank you to those who came by our stand, in particular, Ashleigh Webber from Personnel Today, Kieran Howells from HR Grapevine and John Harvey from Raconteur. It was great to see you!